I woke up this morning earlier than I expected after an early bedtime Friday night. It is unusual to see my pregnant wife still in a deep sleep in the morning, and I know what it would be like if I inadvertently woke her up. With this in mind, I decided my best course of action was to leave the house as soon as possible. It’s been five months since my first PATHFINDER Class (001) was completed, and admittedly I haven’t rucked enough since then. With #PATHFINDER003 kicking off this week, this was the perfect opportunity to get out and get some miles in under the ruck. During this morning stroll, I started to remember what it was like getting out and rucking for the first time. It was a lot of trial and error – figuring out my gear, my clothing, my shoes, my feet, my food, my water, and everything else that goes into rucking regularly for sport or exercise. About four miles in, I started to remember little things that I had forgotten that were once second nature. I also started to feel some muscles being worked that I hadn’t felt in a long time. It was like starting from scratch! I decided that this “getting back to my roots” ruck experience was a good chance to start a series about “How To Ruck”. I will start out with the basics in this post, and work towards more detailed and advanced information in future posts. This is from a civilian’s perspective, as I am not military. I’m not an expert or trainer either, just a regular guy, so take my advice at your own risk. You military guys out there probably know rucking all too well; however, for civilians like myself – rucking may sound like a foreign concept. What exactly is “rucking”? Rucking is simply walking with a weighted backpack. That’s it – pretty simple. Civilians may more commonly know this as “backpacking”. You may be going on an overnight backpack camping trip – carrying all of your gear and other supplies on your back to your campsite and back out in the morning. Or you may just be carrying a backpack with water and snacks for a day hike. In it’s simplest form, this is rucking. In the military, timed ruck marches are common in training. This is, of course, training our soldiers to move themselves and their gear quickly across varying terrain by foot. For civilians, rucking may not be quite so relevant to our every day lives. So why would we consider doing it? I’m not going to go into the positive or negative physical effects of rucking in this post, but there is a lot of information about it via other web sites. I personally started rucking in order to train for a GORUCK Challenge. I realized quickly that walking or PT’ing with a ruck on was a totally different animal than training without one. This is what got me started, and I completed my first GORUCK Challenge – and then my second – and then my third – and it goes on. At this point, rucking is with me to stay, and I enjoy it as a part of my overall training program. If you’ve found this post, you probably already have your own personal reasons for learning more about rucking. One of the myths about rucking we encounter quite often is that there are too many barriers to entry. It makes sense that people might get that impression from guys like me. Watching my Facebook news feed, I always see my friends and other members of the ruck community buying newer and fancier rucks, gear, clothes, socks, nutrition, and of course boots. All of these things can be expensive, and it adds up quick. I am a gear nut myself, and I don’t even want to think about how much money I have personally spent on gear and rucks and everything else I use for rucking. To an outsider looking in, this does seem like a sport that has a pretty large monetary component to it. The truth is that you don’t need to spend much money to get started rucking, if any at all. Don’t get too caught up in your gear on day 1. Use what you already have, what you can borrow, or what you can purchase inexpensively at first. As you get more into rucking, you will figure out how much you want to put into the hobby. In part 1, we will stick to the basics. Later on in this series we will go into the more advanced gear tips. Here’s the gear that you NEED to get started: a backpack, 2 water bottles or a water bladder, shoes suitable for walking, and your standard exercise clothing. That’s it! Grab a backpack from the attic, borrow one, or pick up something inexpensive from the store. Any type of bag will work to get started, even a hydration pack with some extra storage space such as a camelbak. We’ve seen a lot of success locally with people picking up military rucks from the military surplus shop for about $30. Our favorite bags are GORUCK brand rucks. GORUCK bags are the best built bags we have used, and they come with a lifetime warranty against anything but fire damage. Of course, you pay for what you get and GORUCK bags aren’t cheap. For a little less money, you can pick up a ruck from 5.11 Tactical . There are a variety of sizes from 5.11, but the Rush 24 seems to be the product most commonly used in ruck events by average sized people. Now that you’ve got your gear together, it’s time to start training. Start by just going on a walk with your ruck on your back. Begin without much weight – just fill up your water bottles and carry them with you. Get used to wearing your bag and how it feels. If you haven’t done much exercise and training until this point, you may want to stick to un-weighted walks for a while while you build up your leg strength and endurance. Start short, add miles as you are ready. When you’re ready, start adding weight to your ruck. You can do this in various ways. Perhaps the easiest and least time consuming way to get started is to throw some books in there from the bookshelf, or maybe some junk from your closet. Anything will work. Other more common options are using sand filler bags to increase weight, steel plates, or the GORUCK standard brick method. Tip: If you are training for a GORUCK event, you should work your way up to “challenge weight”. 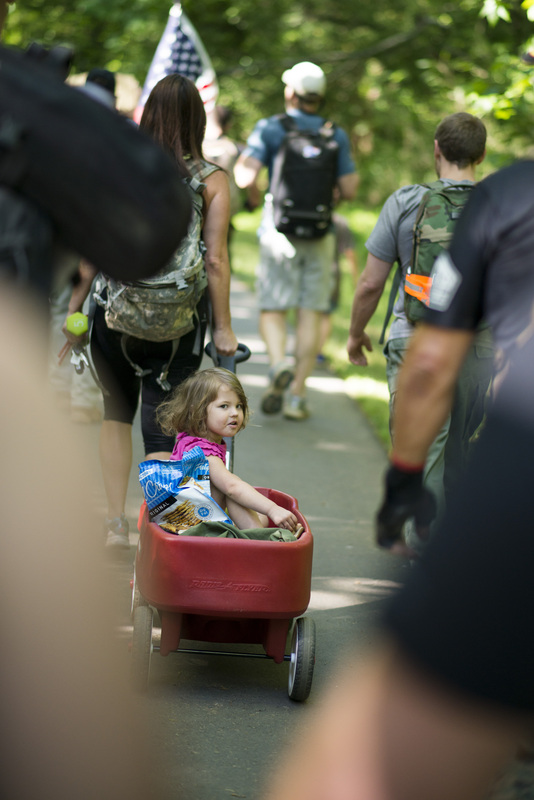 GORUCK defines challenge weight as 6 bricks for individuals weighing over 150 pounds and 4 bricks for individuals weighing under 150 pounds. GORUCK also allows individuals to weight their rucks with sand filler bags – 40 pound fillers for people over 150 pounds, and 20lb fillers for people under 150 pounds. We know – none of this makes sense. The sand requirement and the brick requirement are not equals, but life isn’t fair and neither is GORUCK. Start out by adding a small amount of weight, and add to it as you get stronger. Focus on keeping proper posture while you ruck, and avoid hunching over or arching your back. Don’t ever add more weight than you can safely carry at your strength and fitness level. The key to rucking for exercise or sport is to push your pace. The goal is not a leisurely walk, the goal is to push yourself to get faster and stronger. You should continuously be improving as you continue to train. Monitor your pace and your improvement as you train. Start out by rucking a set distance – 2 miles for example. Time yourself for this distance once a week. Focus on improving that pace each time. In my opinion, your first goal average pace should be 15 minutes per mile, but with time and practice you will crush this pace. While increasing your rucking speed is a primary goal, there is one thing I cannot stress enough. Do not run with a weighted ruck. Rucking should be a brisk paced walk or a shuffle at the most, it should not ever be a run or sprint. The excess weight on your joints from running while you carry the extra weight is bad news and you will regret it. Now you know what rucking is, why you may want to do it, what you need, and how to start rucking on a very basic level. That’s all there is to it, you’re ready to get started! In future parts of this series, I will go more in depth about advanced ruck training and gear tips. If you enjoyed this article, or if you didn’t, please let me know. Feel free to comment with any questions or commentary. I look forward to hearing from you, and hopefully seeing you all under a ruck soon! Please feel free to comment with any questions or feedback about this article. Thanks for taking the time to read it! Doing my 1st GoRuck light challenge…this way very helpful…thank you!! Rick, nice write-up, and yes, you are a gear nut. Great information that I’ll pass on to others. Look forward to Part 2 – ? Jay – Thank you for your feedback! There will be a Part 2 soon. I haven’t started working on it yet – but maybe my Saturday morning ruck will inspire some good content. Thanks for the helpful info. I’ll be doing a challenge over 3 days in 3.5 months so I’ve got to get some serious training ASAP! If you follow How To Ruck parts 1 and 2, and then the PATHFINDER training program, you’ll crush it! When I started rucking, it was with an empty ruck. As I lost weight, I added that amount to the back. Lost 5 lbs, added 5 lbs to the ruck. 3 yrs later, I’m up to 30 lbs in my bag, but I’m still moving 215 lbs. Great work, Dave! Keep it up! Much faster than (‘crushing’) 4mph while still walking, not running? I’m tall and have a long stride, but that seems implausible (for me anyway). I ruck with 30lbs now, and on pavement I can do 4mph, but not much faster, especially with the elevation changes. Never run with a weighted Ruck unless you’ve specifically trained to do so. 15 minute miles are quick, but trust me you can beat this soundly with practice and without running. Of course terrain comes into play but on relatively flat or gently sloping terrain you can get there. Very helpful—this is the only article I’ve found that was accessible to me as a beginner. Great information. I’m an avid backpacker and I use rucking for conditioning and training so I can go further into the back-country. I thought your readers might me interested in different ways to put weight in your pack. I’ve been using ModGear’s water weight, which allows me to ruck on local trails but if it gets too intense I can always drop some weight without littering. SPEARHEAD is a peer-led workout. You participate in all workouts and events at your own risk. SPEARHEAD makes no representations with regard to the skill level of workout leaders, the safety of the exercises performed, or the hazard level of the premises on which the workout is conducted.